If you are looking for an alternative for Esports betting, then we have found one for you. Intertops has been on the scene for a while now. This bookmaker was established in 1983 and they have been on top of the betting scene ever since. Esports betting at Intertops was the latest addition to this popular bookmaker. This Esports betting bookmaker is one of the first bookmakers that decided to create an online business. This occurred 23 years ago and they are always proud to state that Intertops accepted the world’s first ever online sports bet. Esports betting at Intertops is owned by Thinkquick Ltd. This company is registered by the government of St.Kitts and Nevis. Furthermore, they are licensed and regulated by the Kahnawake Gaming Commission. When it comes to bonuses, Intertops is one of the best on the market. Let’s take their welcome bonus as an example. You can claim free Esports bets on sign-up. This bonus is capped at $20 and it is of course, risk-free. Alongside welcome bonus, there are 10 more provided for every player who decides to join. Alongside the huge variety of bonuses to choose from, Esports betting at Intertops is rated highly in the Esports betting scene. The main reason for that are the odds provided by this bookmaker. Most of their matches offer really high odds so make sure to take advantage of this. There are a lot of things you can do on this website. Alongside Esports betting at Intertops, you will also be able to enjoy their casino and poker. Their sportsbook is also offering a huge variety of sports to choose from, but we will discuss this further in the article. In order to be successful in this kind of business, you need to have an excellent support system put in place. If you ever encounter a problem with your Esports bets, you will be able to reach out to their staff in 4 different ways. Even though this bookmaker is not offering a lot of Esports titles to bet on, they are still covering the most important ones. However, I would not be surprised if they decided to add more Esports titles such as Call of Duty, Rainbow Six Siege, KOG and other. When it comes to popular Esports titles, you will be able to find those in the list down below. Esports betting at Intertops does not offer anything new. But still, they are offering everything you need to have in order to create winning Esports bets. Pre-match betting, live betting, and outright betting has all been put in place. However, live betting odds could definitely improve if you ask me. Live betting is a key part for every Esports bookmaker out there. 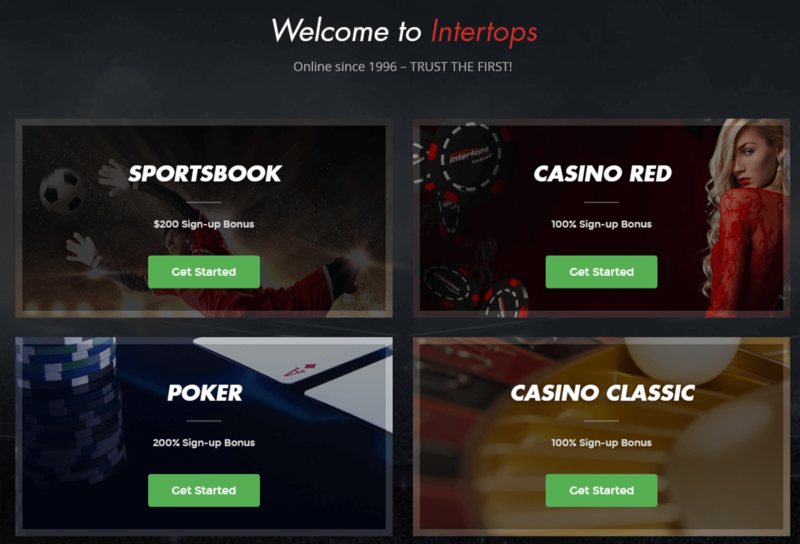 Intertops understood that early on, and they were one of the first bookmakers that introduced Esports live betting. However, their live betting section is kinda unusual, mainly because you will be prompted with a new tab. As mentioned above, live betting odds on Intertops are not so high, and hopefully, they will acknowledge that soon. When it comes to pre-match betting, Intertops offers a lot of special bets. For instance, CSGO betting usually comes with over 20 special bets. So you can easily find special bets such as first map winner, first pistol round winner, round handicap, map handicap, etc. Esports betting at Intertops is not everything this bookmaker offers. They have a huge sportsbook where you can place bets on soccer, tennis, basketball, ice hockey, golf, NFL, MMA, Darts and plenty more. Certain bookmakers make it really hard to find Esports section on their site. This is not the case with Intertops. The left side of the website is all you need to find your Esports bets. At the moment they are using a common logo for their Esports section, a joystick. As we already mentioned, there are three types of Esports bets on Intertops. Odds are not so high for all of these bets though. Pre-match betting odds are on a level above everyone else. However, live betting odds on Esports are very low, and in my personal opinion, they need to be higher. Lastly, outright betting is gaining more and more popularity in the last two years. It is typical to find high odds for these sorts of bets, and Esports betting at Intertops is offering similar odds once compared to their competition. Just like we mentioned above, Esports betting at Intertops is coming with a lot of perks. Alongside risk-free welcome bonus, there are three more similar bonuses. Believe it or not, you can choose which one you want to claim. To keep it simple, you can get 50%, 100% or even 200% on your first deposit. However, there are limits to these welcome bonuses. 50% is capped at $200. 100% is capped at $100. Lastly, $200 is capped at only $50. Do not forget that you have to enter promo codes in order to claim any of the welcome bonuses. There are a lot of payment methods Intertops is accepting. However, not all of those are so popular. What makes some of those methods popular is a minimum deposit. From what we were able to find out, you can deposit a minimum of $5 via PaySafeCard. On the other hand, the maximum amount that you can deposit at once is $5000. When it comes to withdrawals, you will have a huge list to choose from. For instance, you can withdraw your winnings to your credit card, Skrill, NETELLER or even BitCoin. At the moment, the maximum cashout of $10,000 has been put in place. We briefly mentioned that there are 4 different methods of getting help on Intertops. Even though three of these methods are used by almost every other Esports betting bookmaker, Intertops decided to add Skype support as their 4th support method. Secondly, the phone number has also been put in place. Even though this method is almost never used, it is always good to know that there are several ways of getting help. 1-866-549-2437 is a phone number where you can call and resolve your problems. Thirdly, live chat is an essential part of every Esports betting bookmaker. Esports betting at Intertops is not different. Their live chat is available 24/7, 7 days a week. Every one of our questions has been resolved in no time. Staff was very polite and professional as well. However, we had to wait for a couple of minutes before we were transferred to an agent. Last but not least, you can actually call their support via Skype. However, you will need to allow Skype to use your camera for third method. It feels like this is the most personal method of getting support, but it seems like it is working like charm. Our questions were answered really fast.